MP3 Monday! Every “Monday,” (that we feel like it) there will be a new MP3 file from our large, large collection of deservedly obscure vinyl, lovingly hand-ripped to the convenient MP3 format by our hardworking staff of Chinese prisoners! Our grandkids told us that the MP3 is “the shizzle” all the schoolies are giddy for and that’s good enough for us! This week starts us off with a bang- literally! 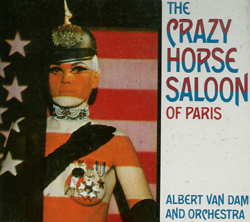 The title track of the 1966 album The Crazy Horse Saloon of Paris by Albert Van Dam & Orchestra kicks off with a champagne cork a-popping! The back cover helpfully informs us The Crazy Horse Saloon is “the most sophisticated strip-tease club in the world.” However, the album cover leads one more to believe it’s the most batshit loony strip-tease club in the world. So does the galloping pace and the circus – freak – meets – speed – freak instrumentation of the title track. Try to listen to it and imagine women stripping to it. It’s extremely difficult. Another reason they’re off their rocker is exemplified by another liner note quote: “…the audience is unfailingly captivated by the ‘plot’ as well as the girl.” Um, sure. That’s why guys go to strip clubs: the overpowering hunger for narrative! Enjoy the whole album- courtesy of… um… us! Happy New Year 2007! And welcome to a new weekly feature here at vgg.com: MP3 Monday! Every Monday, there will be a new MP3 file from our large, large collection of deservedly obscure vinyl, lovingly hand-ripped to the convenient MP3 format by our hardworking staff of Chinese prisoners! Our grandkids have told us that the MP3 is “the shizzle” all the schoolies are giddy for and that’s good enough for us! This week starts us off with a bang- literally! The title track of the 1966 album The Crazy Horse Saloon of Paris by Albert Van Dam & Orchestra kicks off with a champagne cork a-popping! What better way to ring in the new year? The back cover helpfully informs us The Crazy Horse Saloon is “the most sophisticated strip-tease club in the world.” However, the cover leads one more to believe it’s the most batshit loony strip-tease club in the world. So does the galloping pace and the circus – freak – meets – speed – freak instrumentation of the title track. 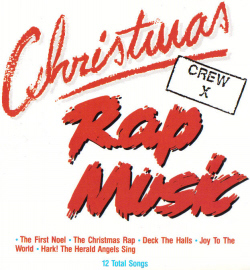 Try to listen to it and imagine women stripping to it. It’s extremely difficult. The fine print: All downloads are provided for entertainment purposes only. VGG.COM not responsible for any auditory nerve damage; ear-gouging; cranial implosion, explosion, or plosion from listening to mp3s. Next week: Hootie and the Blowfish’s biggest hit! Whatever that might have been, exactly. Posted in MP3 Monday | Comments Off on MP3 Monday!